Having graduated from a lowly paid graduate student to a still-lowly-paid postdoc, I'm always on the hunt for cheap food! Cambridge is not known for that, but you can still eat cheaply with a view of the Charles River to boot. How? Head to Dante at the Royal Sonesta hotel on Tuesday early evenings. See, Dante serves $1 oysters everyday from 4-6pm. I went with a friend once and splurged on some Moon Shoal oysters. 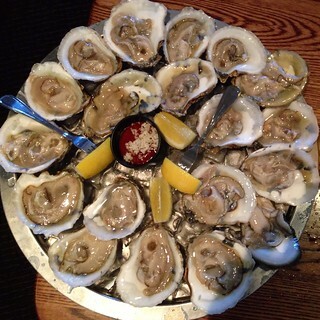 The oysters here are fresh and cleaned properly. If that's not enough, on Tuesdays, Dante also offers $2 grilled cheese in the bar and lounge area. 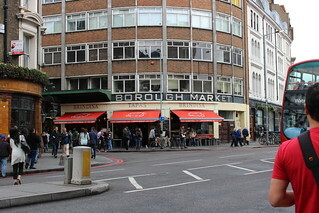 One of the Chowzter stops in London was The Borough Market, one of the largest and oldest food markets in London. 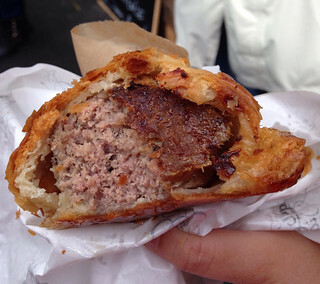 One of the Chowzter picks is the sausage roll from The Ginger Pig. The Ginger Pig is a butcher shop so they make their own pork sausages with sage and breadcrumbs. The sausage is wrapped in a crispy puff pastry. Surprisingly large and sure to fill you up. During the holidays they add cranberry to the sausage as well. 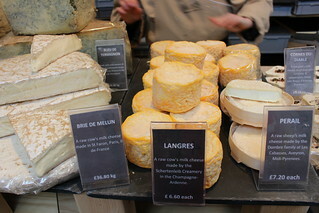 Camembert, with its strong aroma, is not a cheese to be taken lightly. This cheese first originated in Normandy and is made from cow's milk and its surface ripened usually for at least three weeks. 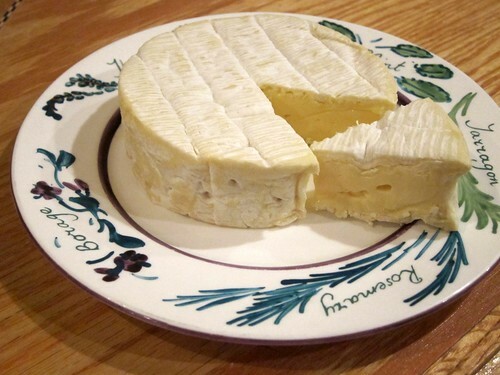 Since Ile de France just came out with a new recipe for their camembert cheese, they offered me a sample for review. It came to my doorstep via overnight delivery. So, I decided to do a recipe with the camembert this time around *gasp*. 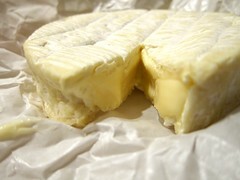 Don't be too surprised though, as I'm no great cook I'm doing a grilled camembert sandwich!